It was not until the end of 1941 that all units were finally in possession of rifles and ammunition. 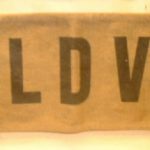 On 24th July 1940 Winston Churchill renamed the LDV and from that date they would forever be known as the “Home Guard”. 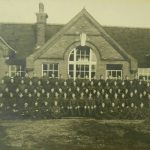 Although they were volunteers, they were still expected to train, turn out for parades and exercise similar to the regular army, however they did not egt paid to do so. 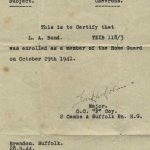 Although the volunteers had families and jobs to attend to, especially at harvest time, some were hauled up before magistrates for failure to attend an exercise. Later in the war, as apathy settled in, then more men failed to attend exercise, more employers refused to allow their workers to attend as their workforce was already dwindling, which led to fewer men joining. So during February 1942 Winston Churchill announced compulsory conscription into the Home Guard and it was at around this time that the Home Guard’s role changed from observing and harassing the enemy to actually taking them on. 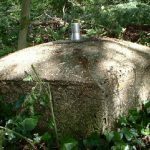 Units were now well equipped, there were no more improvised weapons, they had rifles, spigot mortars, grenades and some even had machine guns. They were even given new powers to help the Police and Fire Brigades, and could request to check people’s ID papers. They also had powers to arrest people without needing a warrant. 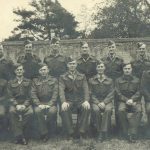 In July 1943, the Brandon and Mildenhall Companies of the 2nd Cambs & Suffolk Battalion, Home Guard, attended a weekend Summer Camp held at Balsham. 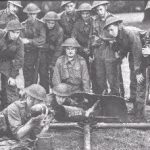 On the Saturday, there was preliminary training, which included the use of handling a Lewis gun, followed by demonstrations of such by the Chippenham squad. On Sunday there was strenuous field firing exercises and for some it was the first time they had used live ammunition. Then a mock battle followed. In January 1945, Brandon’s Home Guard decided to create a rifle club. Lieutenant Wentworth-Smith was elected as Chairman, with Lieutenant Cameron as Hon. Secretary. Major F Holmes presented a cup to the club for competition shooting. The Home Guard Social Committee also held the first of their fortnightly whist drives in the Drill Hall. Lt. Renault was the Master of Ceremonies. 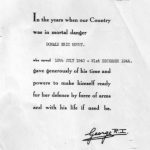 In August 1945, the following appeal was printed in the Bury Free Press from Colonel Garrett, Chairman of the Suffolk Territorial Army Association, to members of the Home guard. 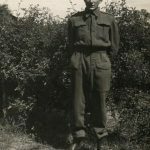 “The final disbandment of the Home Guard in the county has not yet taken place. Members are required to keep their articles of uniform they were allowed to retain on their ‘Stand Down’ until such final disbandment is effected. 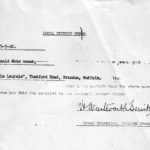 I feel sure that a fair percentage of members will not desire to retain their uniforms as they will have no use for them and it is to these members that I appeal for such articles of uniform, especially battle dress, great coats, boots and anklets to be handed over to the Army Cadet Force units in the County. 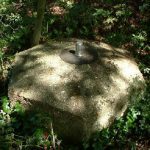 “Bert, my father would go off two or three times a week and most weekends. When they first started they didn’t have a uniform, all they had was an armband. Just like you’ve seen on Dad’s Army, they just had an armband and a broom handle or a pitchfork, or something similar. Then they gradually got kitted out with a uniform.